Sister Vincenta & Me after an afternoon of working with women and children who live at their home. This story in Luke 7:41-50 describes me to a tee. I was a sinner in the prodigal son sense of the word and when Christ came in He enveloped me in His radical, life-changing love and invested in me a deep love for my neighbor, especially those who are marginalized in societies throughout our world. It is at this point that Mother Teresa made her entrance into my life. As a protestant pastor, of both college & career aged adults, we committed our summers to serve those missionaries that our church supported in different countries around the world. Therefore we were tasked with developing a missions training program that would help lay members of our community be prepared to travel, evangelize, participate in prayer ministry, and simply serve the needs of the poor. In the development of our program I suggested that we use a documentary video of Mother Teresa that I had seen on previous occasions. I was tasked with acquiring the video so I went to Blockbuster Video to rent it until I could purchase my own copy. I found the video and brought it to the check-out counter. To my surprise the individual at the counter simply said, “You may have it.” Of course I looked at him with surprise and said, “have it?” He replied, “yes, no one else is renting it and it’s quite old.” I happily took it as a sign from GOD that the utilization of this video as an instrument of training was exactly the right path. We used it for many years with success as part of our training process. However, something strange happened to me. The repetition of watching this video encouraged my passion for the poor / marginalized and gave me an inquisitive spirit relating to the Catholic thought and theology. 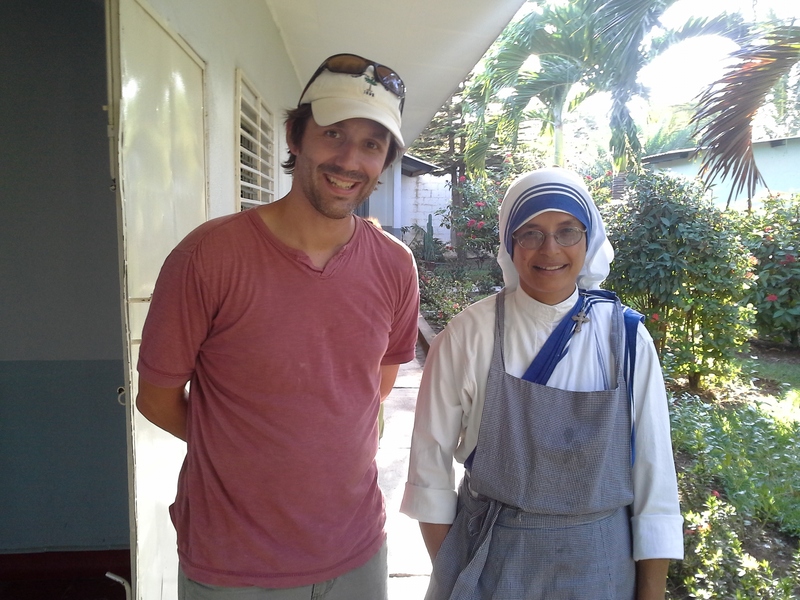 Connect this experience with our service alongside the Missionaries of Charity in Honduras, my growing love for Catholic authors / speakers and ongoing conversations with “random” Catholics on my personal journey and it equates to crossing the Tiber and coming home to the Catholic Church. Often times we forget that it isn’t the BIG EVENTS that have a radical effect on our lives but the culmination of micro-events that end up creating a platform for ongoing conversion. Lucky for me I continued welcoming the opportunity for ongoing conversion and eventually I cam home to the Catholic Church. Thank you Blessed Teresa of Calcutta for your ongoing intercessions and the Missionaries of Charity who allowed time and space for me to ask so many questions. It feels good to be home. This is a wonderful post. Thank you for writing it. Always good to hear from you Rebecca. I am glad that you enjoyed. It has been a joy to work with the Sisters now for over 12 years (during the summer months / short-term). Their impact on my life has been huge. The word Sister used to give me as I was pondering my conversion to Catholicism was this, “Just keep your eyes on Jesus and He will lead you to the truth.” What trust in God / What an evangelist. Thank you GOD. Love this post, Eric. Thanks for putting it out there for others to ponder!!! We miss y’all desperately and wish we could connect more often. My prayer is that future travel will include many speaking events in CT – so I can see you again, and again. Make sure you give our LOVE to your entire family. Know that you are in our prayers. Great journey from which we have learned a lot. Thank you for your beautiful conversion story! Blessed Mother Teresa had a big hand in my conversion as well! I listened to her autobiography at least 3 times! I even taught my Evangelical bible study for girls about her! And I gave each of them the Prayer of St. Francis on a bookmark for their bibles! (Who knows how many more possible conversions got started??!!!). I loved your testimony! It so fun – isn’t it? Thank you for your words of encouragement. I would love to hear your story as well – email me at devoutpilgrim@gmail.com so we can connect, share and discuss. I pray that God would continually use your testimony to bring folks Into the Fullness of our Christian faith. It is so warming to hear of someone coming home by crossing the Tiber. The frustration of seeing so many loved ones struggling with the simplicity of where Truth is so easily found. I pray you will touch many more hearts to take the leap towards truth. Thanks so much for the encouragement. Becoming Catholic was one of the best decisions I have ever made + its so much FUN. People are knocking at the door. The question is, “Will we answer.” I love sharing my faith but also I have been the recipient of so many questions. Frankly, I was surprised how many protestants have questions and interest in the Catholic faith – but they do. Wow! I first received the video from a M.C. sister decades ago. Then, in the mid-90’s was walking through the airport in Guatemata City and realized the video has a scene of M.T. walking there as well. So, felt led to work with the M.C.s in Guatemala City. In 2002 while in Denver the M.C. superior at M.T. AIDS hopice there asked me to be a live-in volunteer for year. What a blessing AND guess who was the superior for 90% of my time there. Sr. Vincenta!!! Last time I talked to her she the superior in Honduras and she was great as usual. Where was the picture taken and do you know where she is serving now. Cool story. I have been working, in short stints, with the MC in Honduras for over 10 years. This was in Aug. 2012 and as you said, “she was great.” I had been used to working with Sister D (esp. during my conversion process) who used to be the Superior in Honduras (Comayagua) but she has since been called to be the novice master at the Mother House in India. Sister Vincenta is awesome and I was awe struck as we talked. Once I asked if they had made any improvements on the chapel. She said no but “let’s go visit the Master.” Just unbelievable the holiness that emanated from her and that statement. I was almost in tears. We visited the Master on our knees, continued the conversation, worked a bit and said goodbye at the end of the day.